When food has a cult following, the operation's almost guaranteed to be a success, as evidenced by In-N-Out Burger on the West coast and Krispy Kreme totally dominating around here... yeah, In-N-Out Burger is a good example. 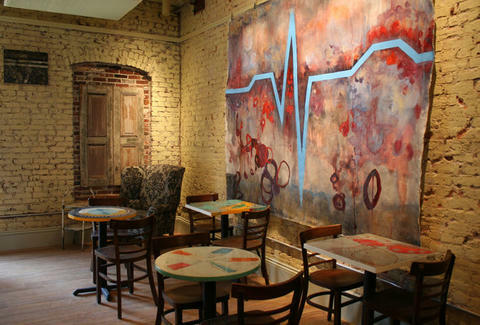 For a new spot from a group with their own cultish following, hit Pavement Coffee House. Soft opening tomorrow, PCH is the latest exposed-brick café offering from the folks behind Allston's cultishly beloved Bagel Rising and Espresso Royal, dripping an inspired selection of coffees, espressos, and loose leaf teas alongside gourmet sammies, paninis, and breakfast in a rustic 65-seat Provençial art house vibe'd spot with unfinished wood floors/beams, vintage chairs, patio seating, old repurposed wood shutters on the walls, and a faux fireplace, by which to warm your faux-hands. To kick-start the morning, there's a selection of bagels and pastries to accompany breakfast sammies like the bacon, onion, and sun-dried tomato'd Jackson Crook, the Sunrise (caged-free egg and cheddar), and a two-egg Tequila Sunrise slathered w/ jalapeno cream cheese, ham/bacon/sausage, and Kurt Russell wearing a Pat Riley suit. For heartier lunch fare, PCH carefully constructs the Tabasco-dripped Ham Hell w/ bacon, cheddar, and tomato; the Ike (chicken salad, bacon, havarti cheese, and a dollop of honey mustard); and a veggie special packed w/ avocado, sprouts, tofu, and Swiss aptly titled the Chia Bagel -- eat promptly, or soak your Chia Bagel, water regularly, and in just 1-2 weeks, watch it grow into a moldy pile of grossness that no one wants to touch. Since it is a coffee house, there's no shortage of java from seven different roasters to complement a special, brewed-to-order slow bar that serves hand-dripped espresso, cortado, and macchiatos, as well as housemade Thai Iced Tea, which has its own cult following -- Thai people!